It is e-mail day here at Leftovers. Here is another one, but this time it is from the head of a Glendora department, one of the people affected (some opponents might say benefiting) by a new salary schedule and style of merit increase for city department heads that I reported in Friday’s newspaper. The letter is from Library Director Robin Weed-Brown, who is the only department head who has received her max amount of merit increases under her previous agreement, and would now be eligible under the new plan for another round of increases. Here is her letter, printed in full, unedited. I love Glendora and the job I have as their Library Director and department head. The Glendora community welcomed me with open arms 10 years ago and I have never looked back. Working for them and being part of their lives has enriched my life in ways I could not have anticipated. I am a professional librarian by passion, not by pay check. My name was mentioned in your article on pay hikes on July 30 and I feel it is important to clarify points as they apply to me. I was hired as a civil service employee, and am not on contract as the other department heads are. The contract department heads have their salaries and benefits individually negotiated when hired and then adjusted annually thereafter. I reached the top of my position’s established 5-step pay scale many years ago. Since then I have received cost-of-living increases when given to all city employees and one adjustment based on a ‘compensation & classification’ study done city-wide. I have not received a raise in several years. My vacation time is allocated based on years of service, as are all civil service employees. The salary and benefit schedule approved by City Council on Tuesday July 27 was truly a step towards improved transparency in local government. Mr. Jeffers should be applauded for recommending it. Raises for department heads, however, should have been put on hold last year and this year in solidarity with other city employees who have taken cuts, in my opinion. Not that anyone asked. Check out letters from angry readers on this same subject here. A lot of people aren’t happy about Glendora’s recent decision to change the way it does merit increases for its department heads. While the city believes the new plan adds transparency while forcing department heads to “excel” rather to just perform satisfactory work to get a raise, many people are writing in complaining about how the city is doing its department heads a favor. Here are some of the e-mails I have been getting today on the subject. PS – I would love to do a reader e-mails post once a week, but I get so very few e-mails from people who express their opinions on things I write about. If you do send me an e-mail on anything on this blog or anything written by me in the Tribune, I may want to use it in the future. You were warned. 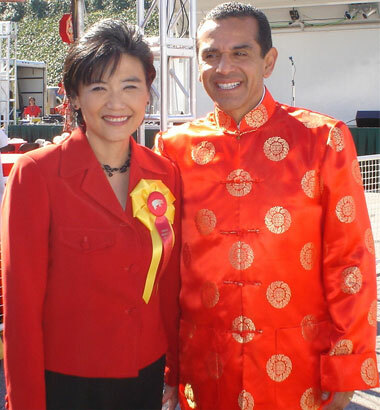 Congresswoman Judy Chu will speak at a fundraising event to support a referendum effort against an Azusa mining plan. The potluck picnic fundraiser will be at 3 p.m. Saturday at the Duarte Historical Museum, 751 Encanto Parkway. Chu has been an opponent of the mining plan after she heard numerous outcries from Duarte officials and residents at various meetings. She has since condemned the plan and the documents surrounding it. The congresswoman represents both Azusa and Duarte. Funds raised the event will support the referendum effort. Officials with the campaign have said they need the money to pay for copying costs and legal fees. With its approved plan, Vulcan swapped its east 80 acres originally permitted for mining for 80 acres on the western end of its property near Duarte. Glendora sets a standard for department head’s raises, should you go all Bell on them? In tomorrow’s paper there will be a story about a new salary schedule for department heads in Glendora. The issue has become something of a controversy, in part because the city is in the midst of heated negotiations with its employee’s association (which is none to happy with this plan) and also because of Bell. Anything with the words “city” “employee” “salaries” is going to be heavily scrutinized right now, which makes it harder to decipher if an idea is good or not. People are going to hear the word “raise” concerning a city employee and automatically jump out of their seat. Talk about themselves getting a raise at their 9-5, and it would be a different story. I am not saying Glendora’s plan is either good or bad, innovative or not. But in times like these, sometimes the assessment of issues is better under objective eyes than reactionary emotions. As for the plan, you can decide for yourself when you read about it in tomorrow’s newspaper. Here is a glimpse. GLENDORA — The City Council unanimously approved a pay raise schedule for department heads to increase transparency and incentives for those positions. The plan sets up a method and schedule for raises for eight city department heads: community services director, deputy city manager, finance director, library director, planning director, police chief, public works director and city clerk. Previously, raises for department heads were at the discretion of the city manager and could be done without the public’s knowledge, City Manager Chris Jeffers said. City employee salaries have been under scrutiny in the wake of the pay scandal in Bell, where it was found that the city manager was making close to $800,000, and others were receiving salaries far above the average for their positions. But opponents of Glendora’s new salary schedule believe the plan is a way for the city to ensure higher salaries for department heads while the city has laid off employees. Celebrity attorney Gloria Allred is going hungry. and Moe the Chimp’s owners St. James and LaDonna Davis, as well as being heavily critical of Octomom Nadya Suleman, is going on a hunger strike to put a focus on the Equal Rights Amendment. So, while Allred may not have her meals, she sure is getting her filling of media attention – again. As a side note, I hope I don’t melt down the Internets with this post that includes tags/keywords for Moe the Chimp, a Tiger Woods mistress, Octomom and Gloria Allred. Hat trick! Oh, and not to forget equal rights for women. Attorney Gloria Allred announced today that she has begun a 90 meal solid food fast to draw attention to the need to pass the Equal Rights Amendment, a proposed amendment to the U.S. Constitution which would provide a constitutional guarantee of equal rights for women. The ERA has since been reintroduced into Congress (HJ.Res.61) but is still in the process of gathering co-sponsors. Ms. Allred’s 90 meal hunger strike fast, in which she will give up solid food for 30 days, will end on August 26, 2010, Women’s Equality Day. That day marks the 90th anniversary of women’s winning the right to vote in the U.S. by the addition of the 19th Amendment suffrage to the U.S. Constitution. This just in, a U.S. District Judge has blocked all the important parts of Arizona’s immigration law. This, most assuredly, isn’t the end of this fight that may end up in the Supreme Court. Will this end Los Angeles County’s boycott of Arizona? PHOENIX – A judge has blocked the most controversial sections of Arizona’s new immigration law from taking effect Thursday, handing a major legal victory to opponents of the crackdown. I don’t have any new perspective or rich commentary on the subject, but when I hear about this sort of thing it drives me crazy. A man, doing his usual garage sale shopping, bought a box of pictures for $45. They turned out to be worth $200 million when experts agreed they were some lost photos taken by Ansel Adams. I go to garage sales and I am ecstatic if I find a warn down piece of furniture I can maybe turn into something usable. But $200 million photos for $45. I would hate to be the guy that sold them, but luck isn’t for the foolish. Oh! And there is a local connection, Ansel Adams taught in Pasadena and possibly stored the photos there, so says an expert in CNN’s story. For some cities, things seem to be getting worse before they get better. Faced with declining revenues, it appears South El Monte must make some substantial cuts to city services and public safety. Some $400,000 in layoffs is the recommended action. Mixed in with that is the possibility of asking voters to approve a sales tax increase. The way forward will be discussed at Tuesday’s city council meeting.